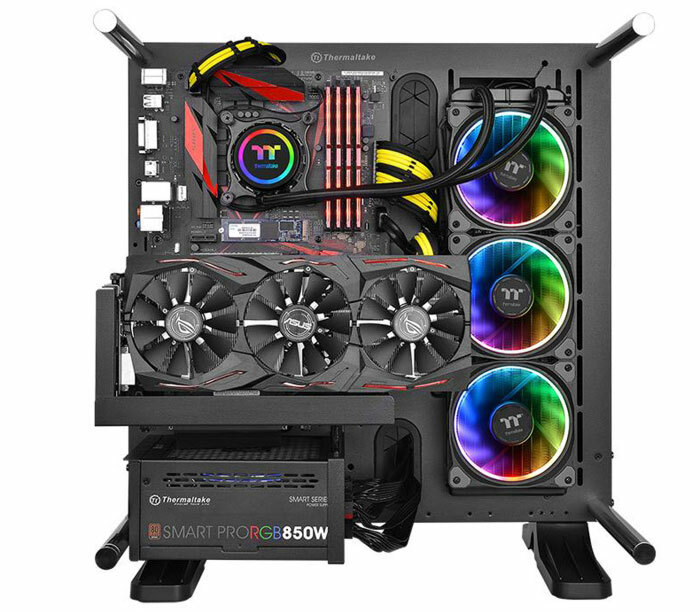 Cooling, chassis, and PSU specialist Thermaltake has announced a new range of AiO liquid cooling products that it claims represent a world first. The new Thermaltake Floe Riing RGB TT Premium AiO coolers feature built in 16.8 million colour RGB LEDs, combined with "superior quality, and extraordinary performance". The Thermaltake Floe Riing RGB 360 TT Premium Edition (€224.90) is the largest of the new product range which also includes 280mm (€184.90), and 240mm (€179.90) designs. Those familiar with AiO coolers will know these numerical references in the model names correspond to the radiator sizes; the Thermaltake Floe Riing RGB TT Premium 360 will employ 3x 120mm fans, the 280 will use 2x 140mm fans, and the 240 will be fitted with 2x 120mm fans. Whichever model you choose, it will offer the same base functionality and RGB frills but just offer different cooling capacity. Thermaltake says that in its new AiO cooler products "the large surface radiator plus high-performance waterblock and pump delivers the ultimate CPU cooling for gaming or other GPU intense tasks." In addition, both the waterblock and fans contains multiple addressable RGB LEDs. To make the most of the lighting effects capability Thermaltake facilitates control via its Riing Plus RGB software and Riing Plus RGB app. Lighting is easily personalisable but there are 12 preset light modes ready to get you going. 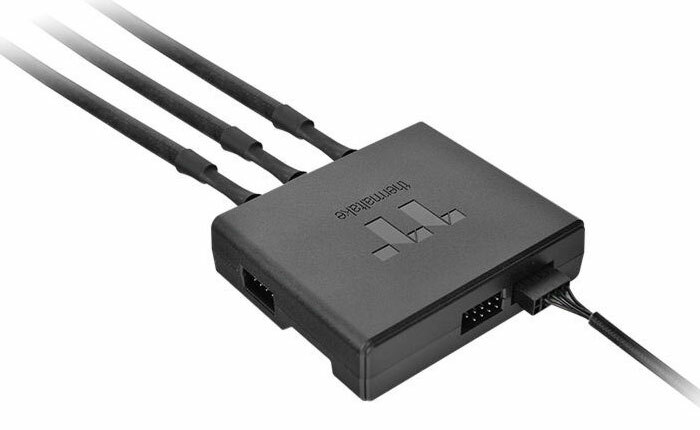 Furthermore, the user can quickly adjust between three colour modes and four lighting speeds. Thermaltake's software isn't just there for eye candy, it can configure the cooling fans operation and offer real-time fan warning alerts. Another lighting mode called 'Thermal mode' lets the fan and waterblock function as a colour gradient thermometer. This particular preset shifts the lighting hue from blue (CPU temperature ≦ 40℃) to red (CPU temperature ≧ 65℃). A digital lighting controller is supplied with all the Floe Riing RGB TT Premium AiO coolers and can control up to 5 devices. 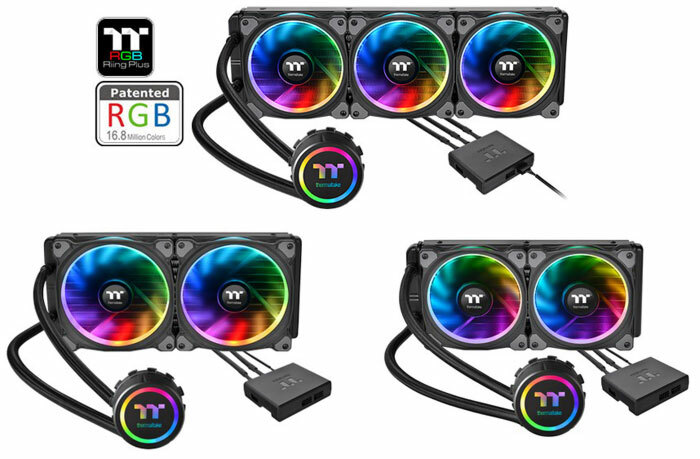 Other standard features of the Thermaltake Floe Riing RGB TT Premium AiO coolers are; a high performance water block, high-static pressure fans, durable sleeved cables, a high reliability pump, hydraulic bearings, simple setup, and compatibility with modern CPU sockets such as Intel LGA 2066 and AMD AM4. These new AiOs are available to buy now, with prices varying according to region, click through to the appropriate web store below. Sleeved cables into the motherboard, but not sleeved from the psu? Another ‘world’s first' this week, just for putting an RGB LED in place of a white one? Good lord. 200 dollars for a 360mm AIO. i rather buy Fractal Design's 360mm AIO and add rgb fans to it! 16.8 million colours is fine but what's the gamut density? I need a cooler that can cover the ProPhoto RGB colour space as there are some crucial shades of blue that are absolutely necessary for my rig.